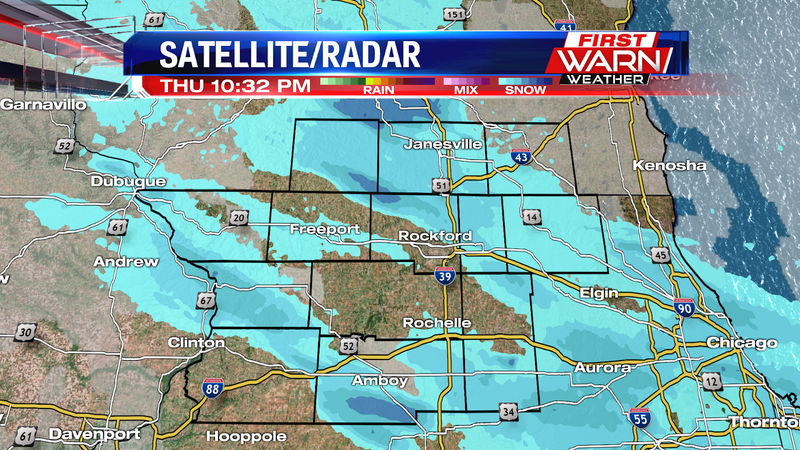 10:20pm Update: Light snow continues to fall this evening with totals already reaching two inches out in Freeport. Temperatures remain below zero all across northern Illinois and southern Wisconsin allowing the snow to quickly accumulate and stick to roads. The dry and cold air mass in place will allow the snow to fluff up between 1-3 inches area wide. Most of the snow will be done between Midnight and 2am, but roads will likely still be slick heading into Friday morning. Take it slow on the morning commute. (8:52:35 PM) nwsbot: Local Storm Report by NWS DVN: Freeport [Stephenson Co, IL] trained spotter reports SNOW of M2.0 INCH at 08:35 PM CST -- still snowing. 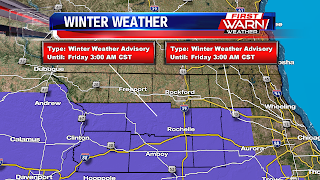 Winter Weather Advisories have been issued for Carroll, Whiteside, Ogle, Lee and DeKalb counties until early Friday mornig as light snow continues to fall across much of northern Illinois. 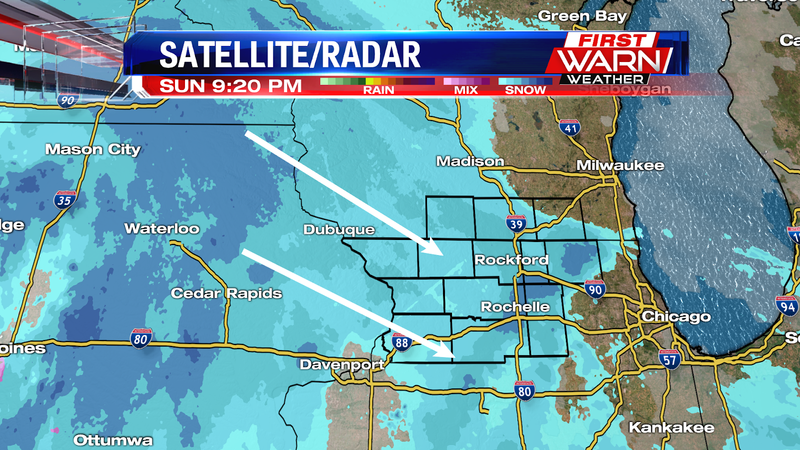 Moderate snowfall with accumulations already reaching three inches has fallen across southeast Iowa, moving into west-central Illinois. Temperatures are still below zero degrees Thursday evening which will allow the snow to quickly stick to roads through the late afternoon and evening commute. Salt becomes less effective the colder the temperature gets, meaning roads will be slick through the night. There could even be some slick spots heading into Friday morning's commute. Most of the snow will be wrapping up between Midnight and 2am Friday morning, with a few flurries likely through early Friday morning. Skies will remain cloudy Friday afternoon holding temperatures in the upper teens, to right around 20 degrees. 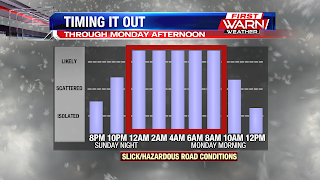 If you do head out Thursday evening be prepared for slick roads and make sure to take your time. Breaking News! It's official! 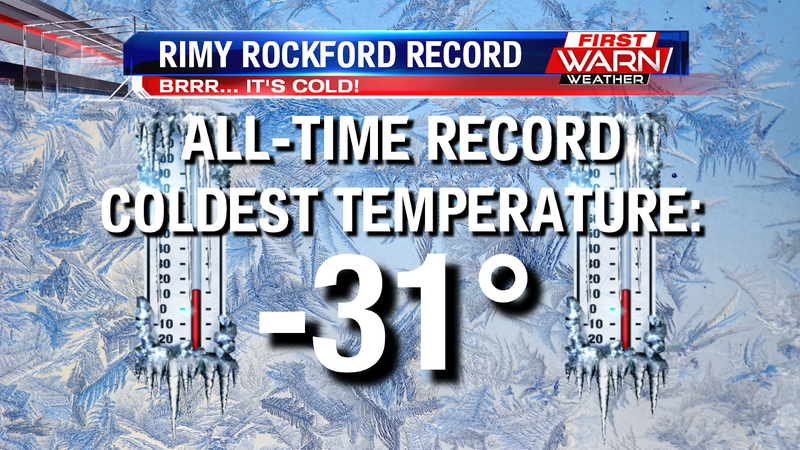 We've broken the all-time coldest temperature in Rockford! We made it down to -31°. We'll start to thaw out in the next few days because above average temperatures are in store for the weekend. Current temperatures across the Stateline range anywhere from -18 to -23 degrees. The wind isn't as strong as Wednesday night, but wherever there is a little breeze the wind chill drops down near -40 degrees. 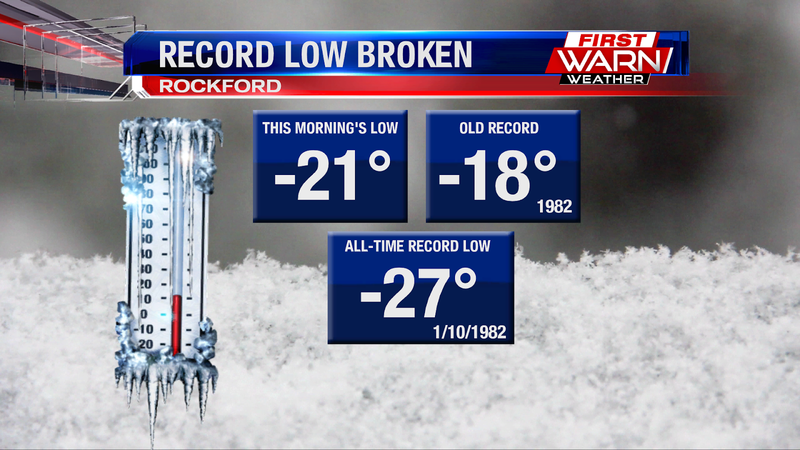 The all time record low for Rockford is -27 degrees set back in January 10th, 1982. It's likely that record will be challenged, if not broken, by Thursday morning. 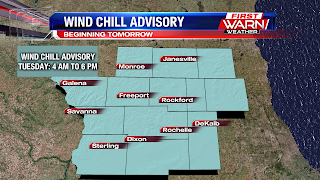 Current forecast calls for lows down to -30 degrees by morning. 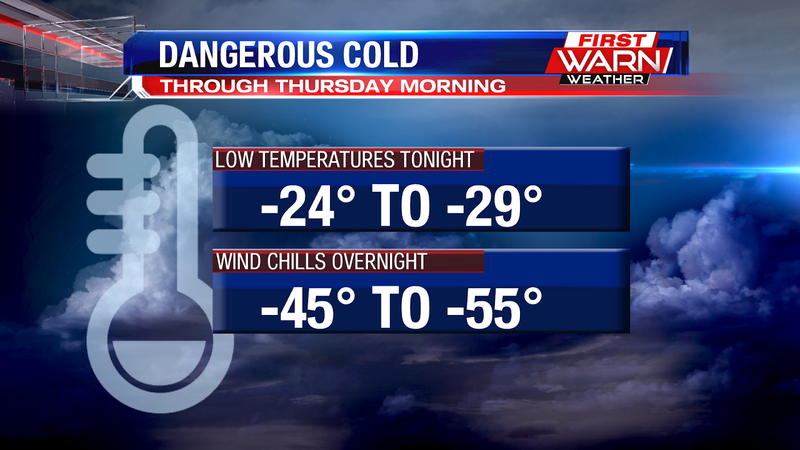 And with just the right conditions, there may be some spots that approach -35 degrees, or colder, by Thursday morning! Dangerously cold wind chills were experienced for many Wednesday morning as the wind chill temperature dropped as low as -56 degrees in some spots. While the wind won't be quite as strong as Wednesday night, actual air temperatures will be colder keeping wind chills as low as -45 to -47 degrees by Thursday morning. 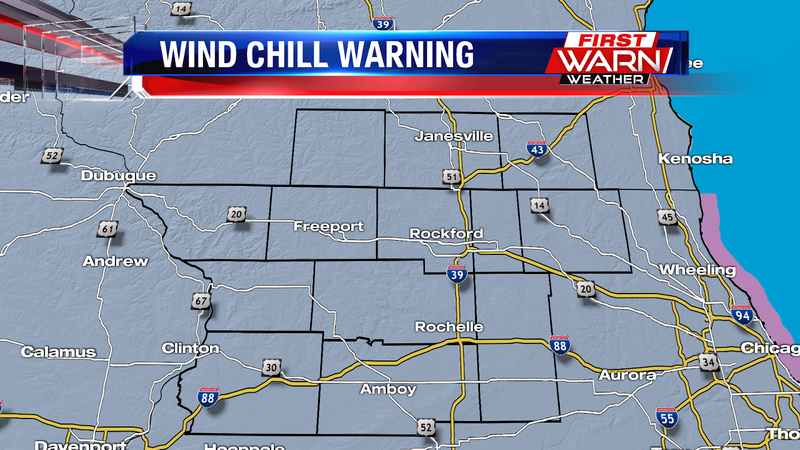 Wind Chill Warnings remain in effect for the entire Stateline through Noon Thursday. Remember that when wind chills are this cold, frostbite can occur within as little as five minutes. If you must go out tomorrow morning make sure you cover up any exposed skin and limit your time outdoors. While wind chills will gradually improve Thursday afternoon and be more typical of what we're used to during the winter months, it'll still feel cold. The worst time to be outdoors will be through mid-morning Thursday. Extreme temperatures and wind chills Wednesday morning brought temperatures down as low as -27 degrees in some locations throughout the Stateline, with Rockford officially tumbling to -25 degrees. 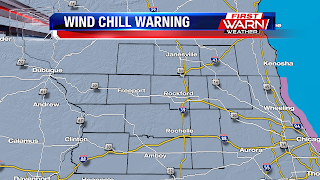 Wind chill values were as low as -56 degrees in some spots with gusty West winds. 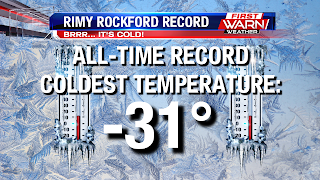 A new record low temperature was set in Rockford, breaking the previous record low of -19 degrees set back in 1966. Record low temperatures will likely be reached Thursday morning with the low expected to tumble all the way down to -30 degrees. 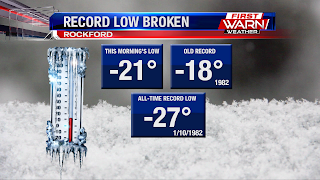 Not only could this break our daily record low temperature, but also the all time record low temperature for Rockford which is -27 degrees set back on January 10th, 1982. In case you didn't know... it's cold! 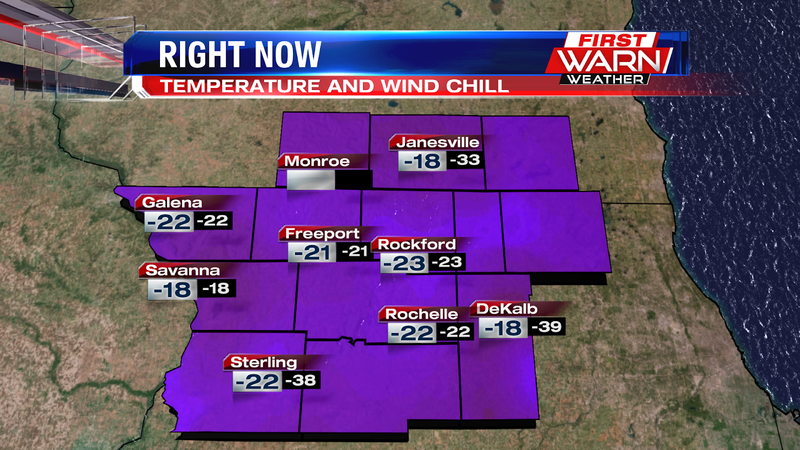 We have a current temperature in Rockford of -21°, as of 3am. Winds are gusting upwards of 30mph, which is making wind chills down near -50° in many locations. It's only going to get worse before it gets better. Wind chills as we go into the rest of the morning hours will be in the -50° to -55° range. That puts us over 100° colder than what it is going to feel like in Miami, Florida. Be safe and bundle up! A quick moving clipper system Thursday afternoon and evening will bring another round of light snow to northern Illinois and southern Wisconsin. Moisture will remain limited with this system, but stronger forcing in the atmosphere and a very cold air mass will allow the snow to 'fluff' up to at least an inch or two, possibly three, by Friday morning. Thursday morning will be dry, but cold. 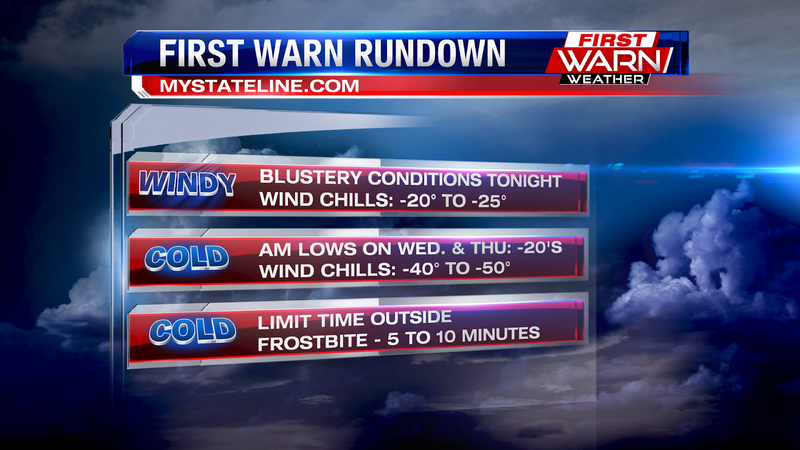 Temperatures could be as low as -30 degrees by sunrise in some locations. The wind isn't expected to be as strong as Wednesday morning but wind chills could fall close to -45 degrees by Thursday morning. 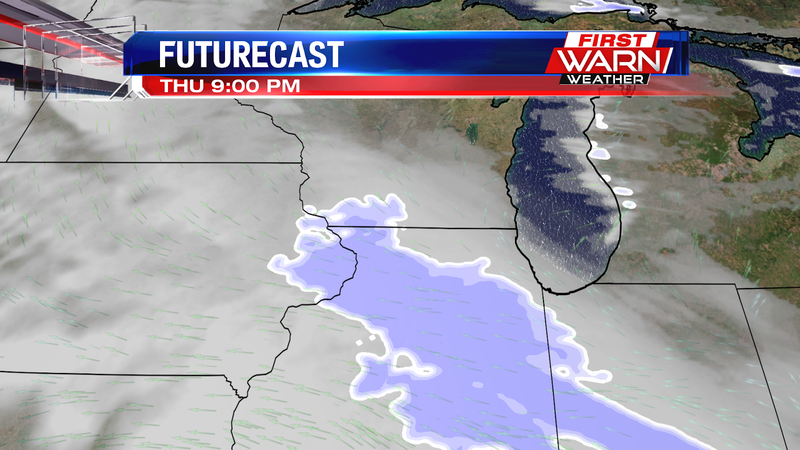 Cloud cover will thicken up during the day with light snow develop between 3pm-5pm Thursday. Most of the snow should be done with by Friday morning. 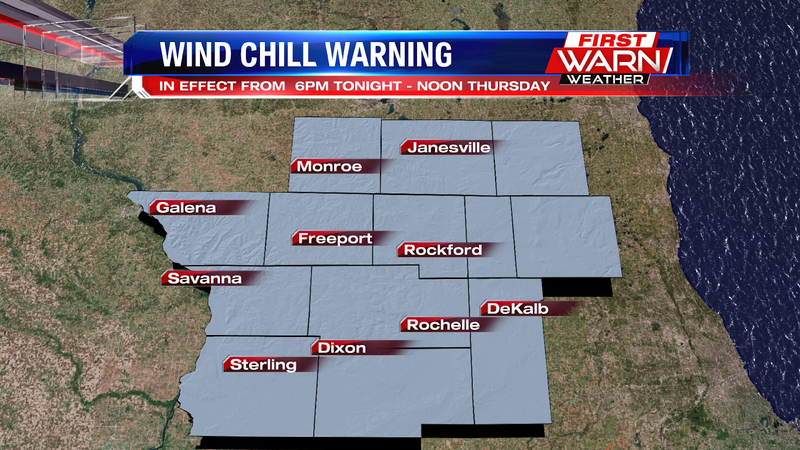 Wind Chill Warnings remain in effect for northern Illinois and southern Wisconsin through early Thursday afternoon. Temperatures have already fallen below zero with wind chill readings approaching, and surpassing in some locations, -30 degrees. -45 degrees by Thursday morning. Strong west winds Tuesday afternoon and evening have produced near whiteout conditions in many open and rural areas due to blowing snow. North/South roads are mostly impacted, but there are some East/West roads that will experience the blowing snow as well. 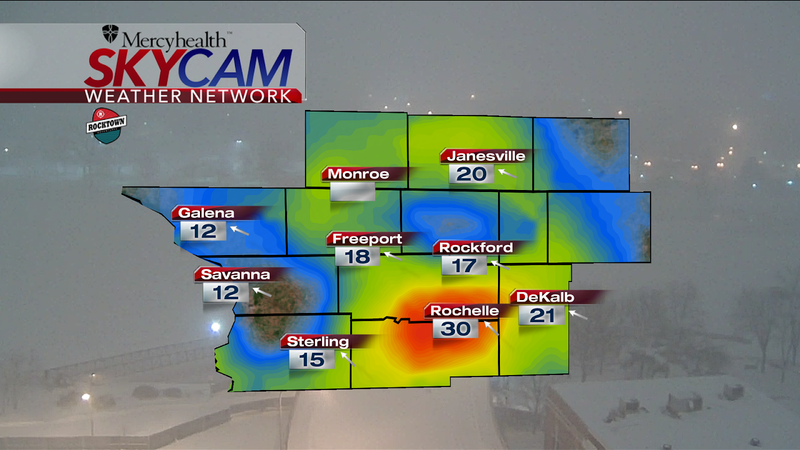 Wind gusts Tuesday afternoon have been as high as 30mph, whipping around the freshly fallen snow from Monday morning. Drifting snow will also be a threat, especially in the North lanes. Slick roads will be possible both Tuesday night and Wednesday morning as gusty winds are expected to remain through mid-morning Wednesday. 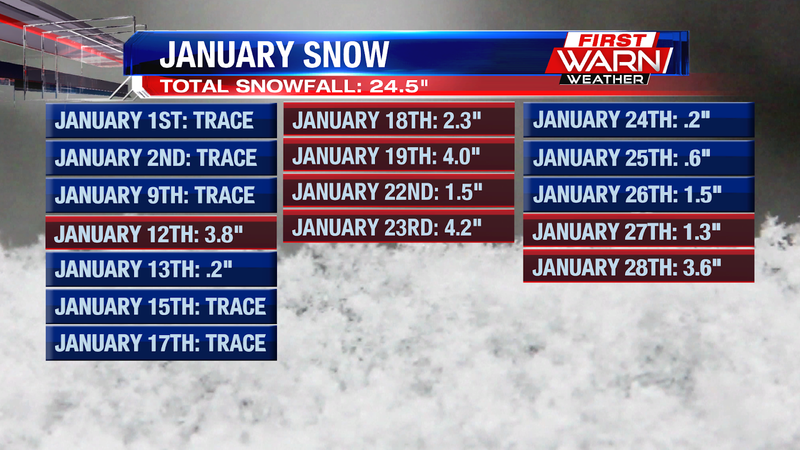 Yesterday's snowfall makes the 4th "decent" snowfall event for the month of January. While we started the month off quite, just like December, we've picked back up. 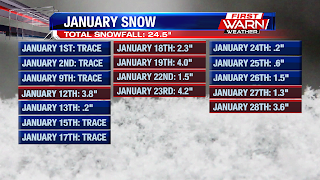 So far, we've seen 24.5" of snow for January. It's cold outside, and it's only going to get worse. Currently we're in the single digits for current temperatures. Wind chills are in the negative teens to negative 20s. 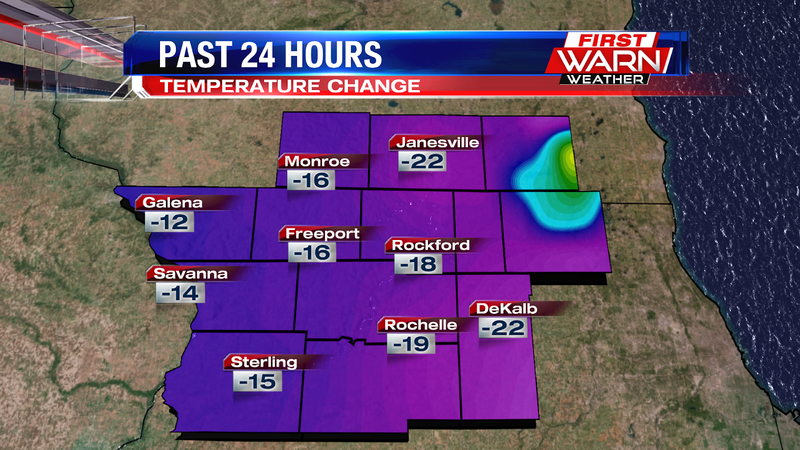 And we are upwards of 20 plus degrees colder than this time yesterday. I hate to be the bearer of bad news, but it's only going to get colder tonight. With the bitterly cold air already, the entire viewing area is under a Wind Chill Advisory until 6pm for wind chills anywhere from -20° to -30°. Once we get to 6pm, the Wind Chill Advisory will get bumped up to a Wind Chill Warning until noon Thursday. Wind chills are expected to get as low as -40° to -55° tonight, throughout your Wednesday and into the start of Thursday. This is all thanks to the polar vortex. Yes, that's right the polar vortex is back in the news. 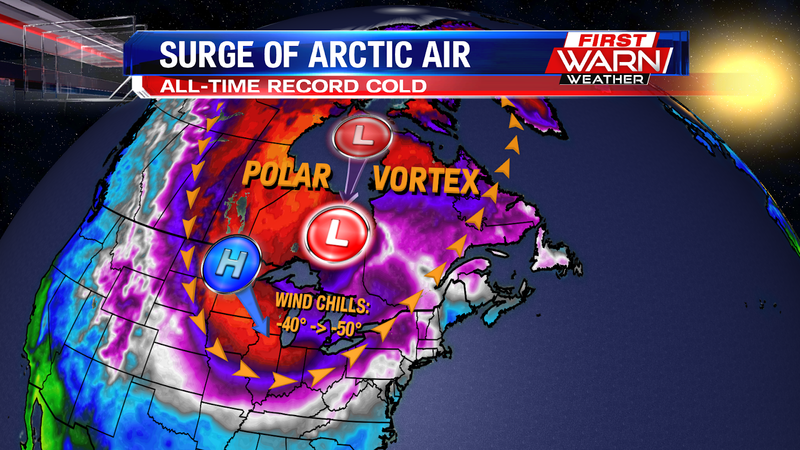 Every once in a while it will weaken, and dip to the south enough that cold air will flow into our neck of the woods. 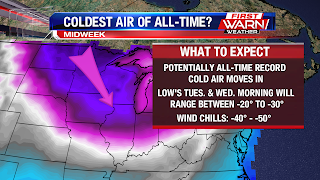 It's going to push a arctic high south providing for the coldest air mass in years to invade the Stateline. We could see record low temperatures, record low high temperatures and the all-time record cold temperature broken. Good Evening Stateline! We got some record cold on the way. 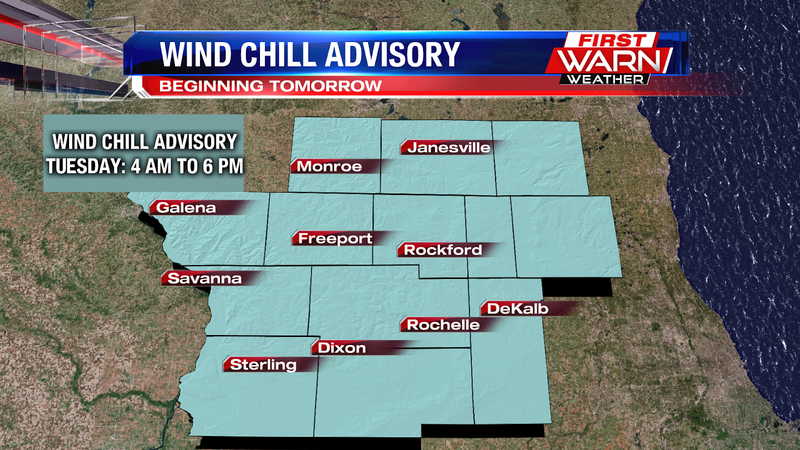 But first, we start off the night with a wind chill advisory that will go into effect at 4 AM tomorrow morning. 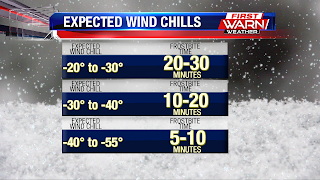 Ahead of the record cold air, wind chills will be in the range of -20° to -30°. 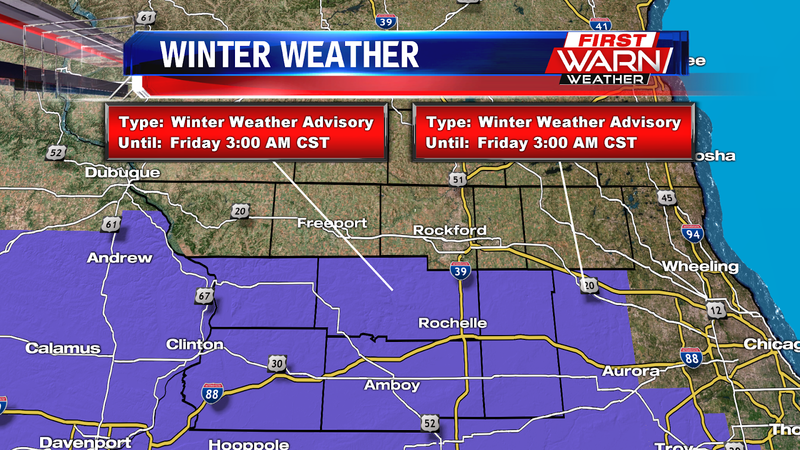 This advisory will stay into effect until 6 PM tomorrow evening. Immediately following that, a wind chill warning will go into effect beginning at 6 PM tomorrow evening and last until noon on Thursday. 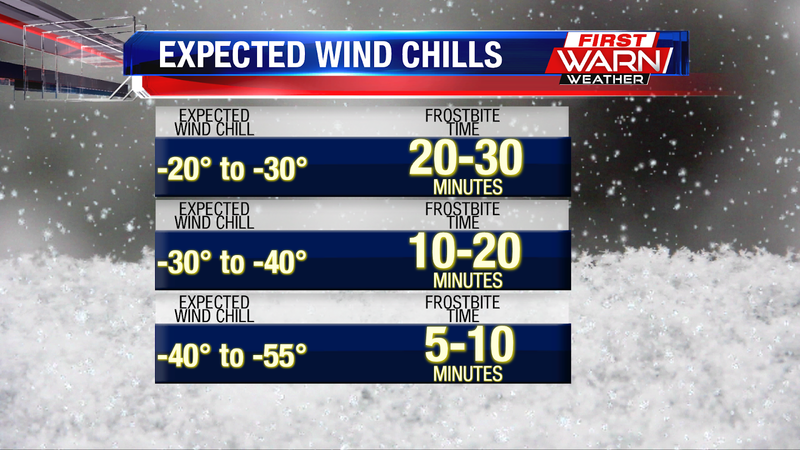 Wind chills during this time period will be in the -40° to -50° range with some pushing -55°. 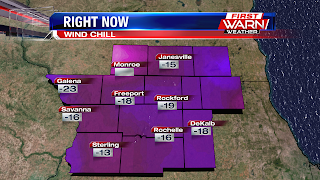 We will feel the worst of the wind chills Wednesday morning when wind chills will approach -50° by 6 AM. 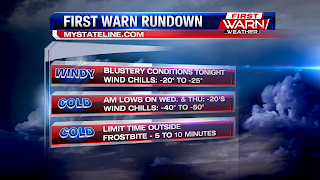 Here is the first warn rundown on the record breaking cold heading our way. Morning low's on Wednesday and Thursday will be in the -20's. 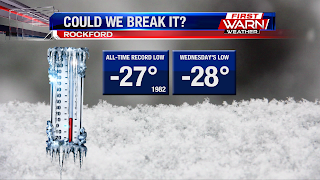 The forecast is calling for temperatures to approach or even break Rockford's all-time record low of -27° that was set back on January 10th, 1982. 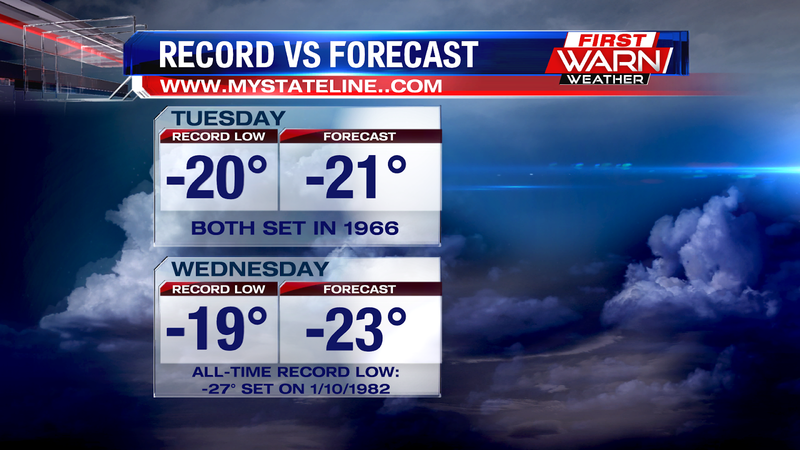 We will most likely also see the record low's for Wednesday & Thursday broken. A few things to think about the next few days. Stay indoors as much as possible. Limit your time outside. If having to go outside, dress up in multiple layers because frostbite symptoms can occur within 50 to 10 minutes of being outside in these extremely dangerous conditions. STAY WARM EVERYONE! After today's snowfall, we are in for a surge of arctic air Tuesday night and lingering into Thursday morning. This is a result of the polar vortex dipping south. 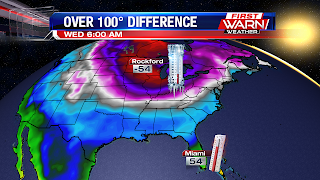 Yes, you read that right... the polar vortex is back in the news. Normally, the polar vortex rotates over the North Pole and helsp to keep the arctic air locked in place. However, every once in a while it will weaken, and dip to the south enough that cold air will flow into our neck of the woods. Tuesday night and into Thursday morning is a perfect example of this. 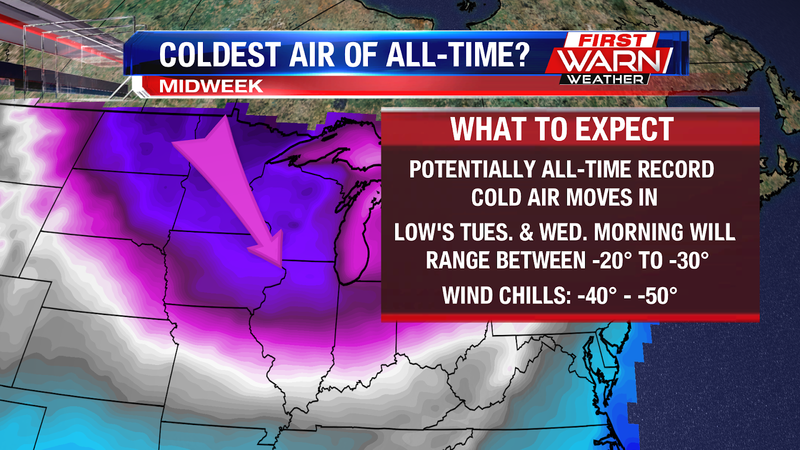 It's going to push a arctic high south providing for the coldest air mass in years to invade the Stateline. 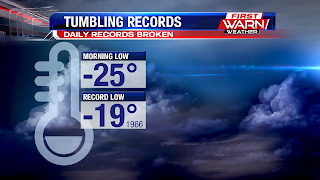 We could see record low temperatures, record low high temperatures and the all-time record cold temperature broken. Expect highs in the negative teens and single digits Wednesday and Thursday, and overnight lows in the -20° to -30° range. 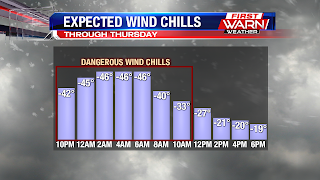 Factoring in the wind, we could see wind chills down into the -40° to -50° range. 10:30am Update: The center of the surface low pressure system has now moved into southeast Wisconsin with fog and haze over much of northern Illinois and southern Wisconsin. Colder air on the backside of the low will begin to move into the Stateline Monday afternoon, bringing temperatures down into the single digits by the afternoon and evening, and then below zero by Monday night. 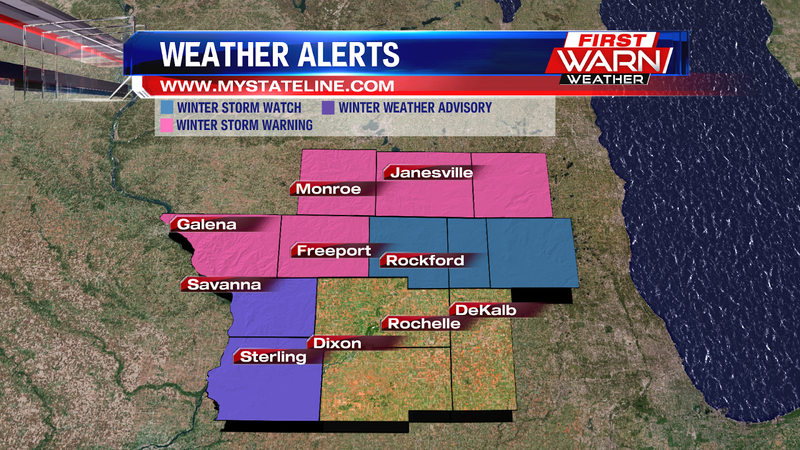 Winter Weather Advisories are now in effect for all of northern Illinois (counties in purple) while Winter Storm Warnings are in effect for southern Wisconsin (counties in pink). (9:10:43 AM) nwsbot: Local Storm Report by NWS MKX: 1 ESE Beloit [Rock Co, WI] cocorahs reports SNOW of M3.2 INCH at 07:20 AM CST -- cocorahs station wi-rk-15, beloit. (9:10:43 AM) nwsbot: Local Storm Report by NWS MKX: 1 N Janesville [Rock Co, WI] co-op observer reports SNOW of M0.9 INCH at 27 Jan, 09:30 AM CST -- co-op observer station argw3, argyle. 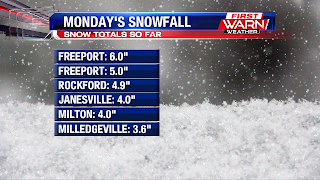 Update snowfall totals so far Monday morning. 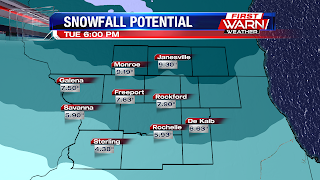 Snowfall totals range anywhere from 3-6 inches area wide Monday morning. 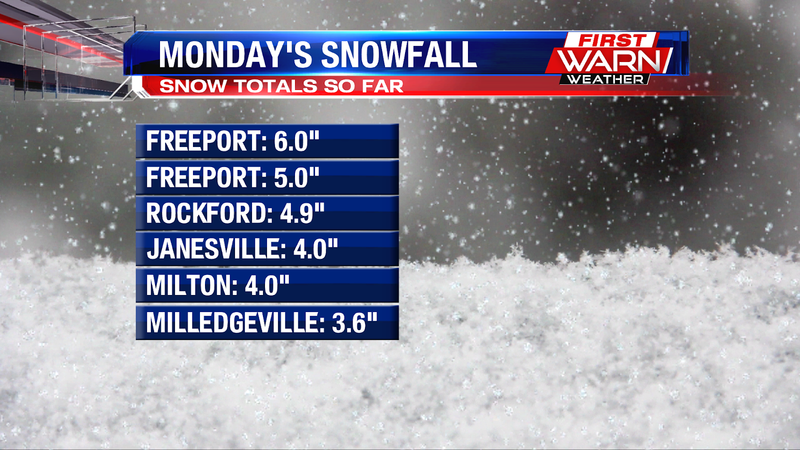 Additional snow totals will be added throughout the morning. (7:42:37 AM) nwsbot: Local Storm Report by NWS DVN: Freeport [Stephenson Co, IL] trained spotter reports SNOW of M6.0 INCH at 07:40 AM CST -- total. 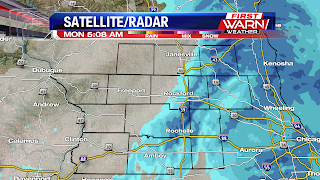 (7:45:38 AM) nwsbot: Local Storm Report by NWS DVN: 2 SE Galena Territory [Jo Daviess Co, IL] trained spotter reports SNOW of M4.1 INCH at 07:44 AM CST -- total. (7:47:58 AM) nwsbot: Local Storm Report by NWS DVN: Milledgeville [Carroll Co, IL] trained spotter reports SNOW of M3.6 INCH at 07:47 AM CST -- total. Here are a few snow totals we've received so far this morning. 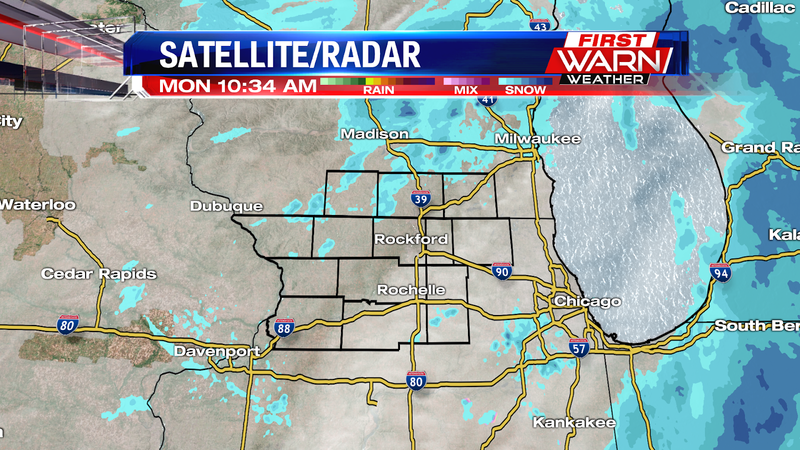 Most of the accumulating snow is done, but a quick inch or two remains possible later this afternoon. 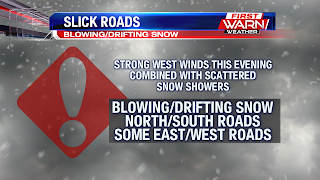 Blowing and drifting snow likely through the afternoon and evening commute. 7:30am Update: Updated road conditions across northern Illinois - roads reported nearly all snow/ice covered Monday morning. 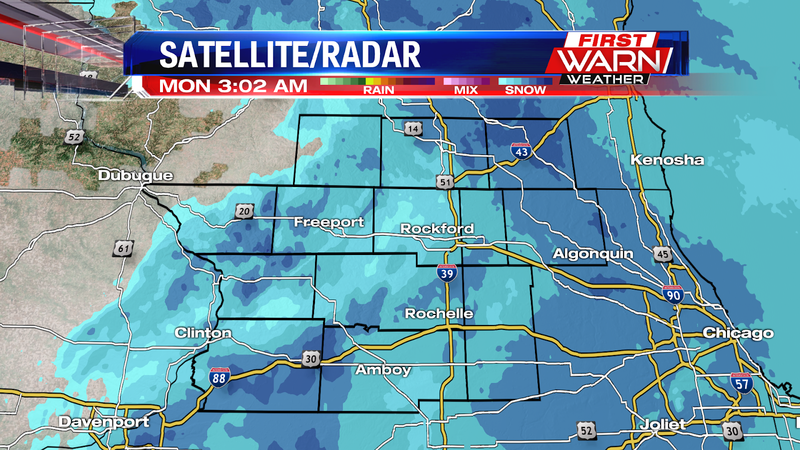 (6:56:51 AM) nwsbot: Local Storm Report by NWS LOT: 1 S Rochelle [Ogle Co, IL] co-op observer reports SNOW of M3.2 INCH at 06:00 AM CST -- co-op observer station rchi2, rochelle. 6:40am Update: Current road conditions per IDOT Monday morning. Meteorologist Ryan Belz is reporting some light freezing drizzle on the backside of the snow, causing a thin glaze on the windshield of the car. 6:20am Update: Dry air quickly moving into northern Illinois and southern Wisconsin has caused the snow to come to an end from west to east this morning. 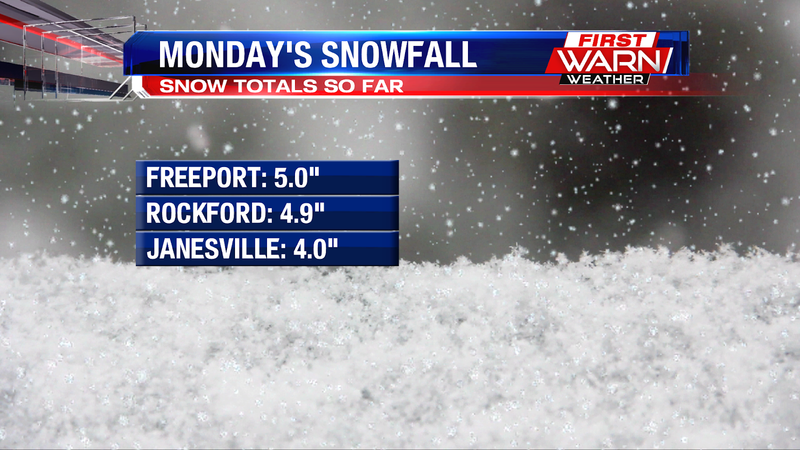 So far the Rockford Airport has received 3.6 inches of snow. 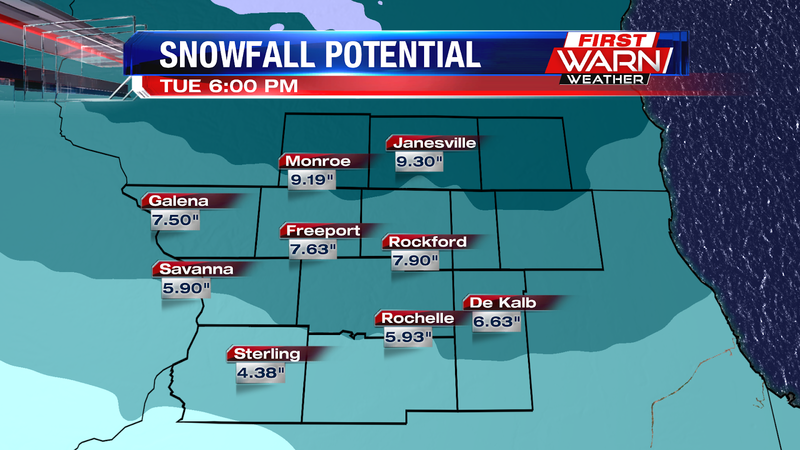 Snow totals range anywhere from 3-5 inches area wide. 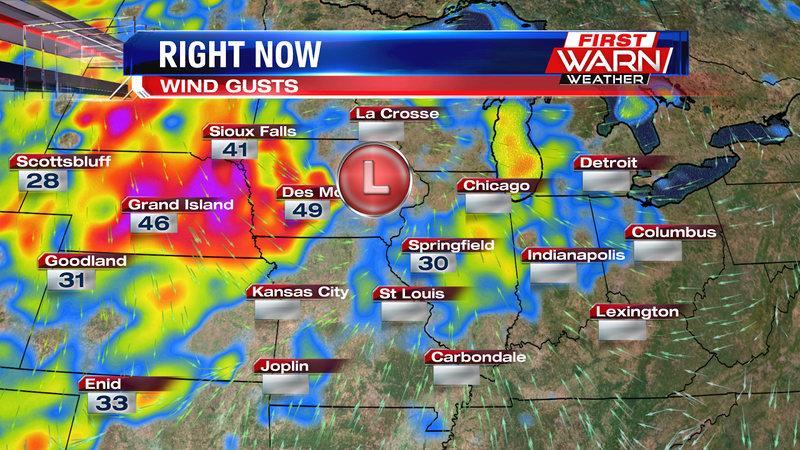 5:35am Update: Look at how strong winds are behind low pressure over northeast Iowa! Winds will lighten up some this morning but then pick right back up during the afternoon. 5:15am Update: The snow is coming to an end from west to east this morning, but not before bringing between four to five inches across much of the area. As low pressure moves closer to northern Illinois, winds will begin to lighten up during later this morning before increasing this afternoon from the northwest. 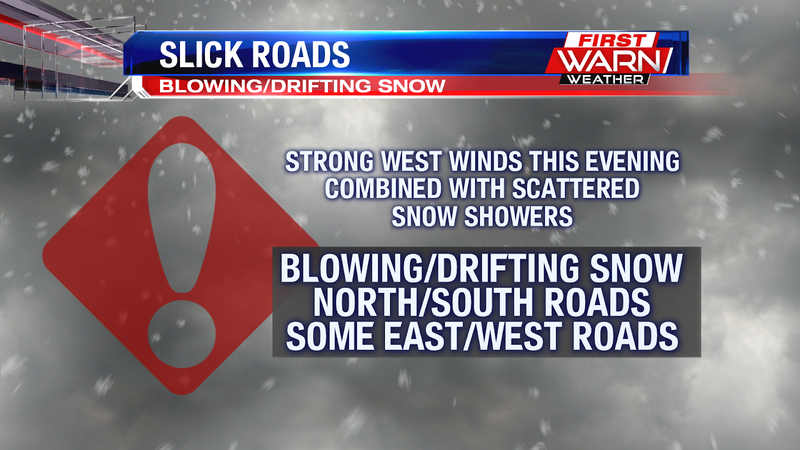 Blowing and drifting snow will be likely once again through the afternoon and evening commute. 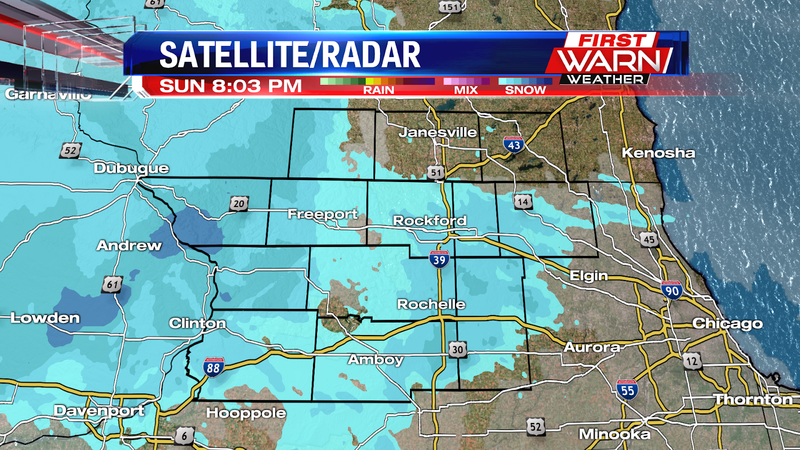 Light snow will redevelop on the backside of the low with an additional inch or two coming down through late afternoon. 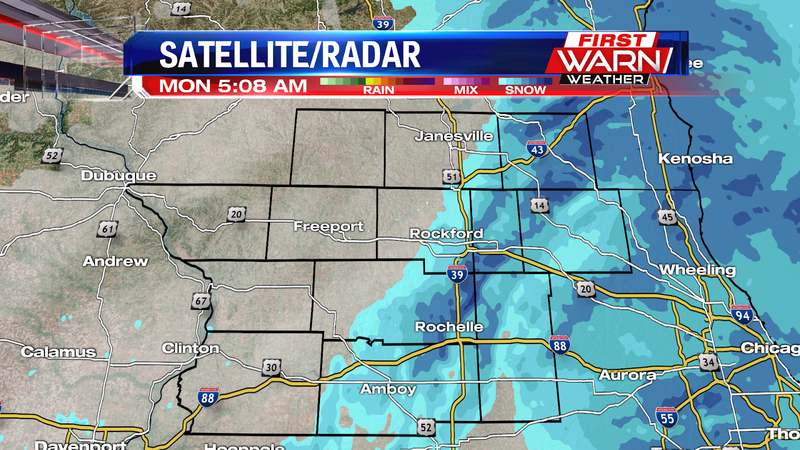 3:00am Update: Light to moderate snow continues to move east across the Stateline. 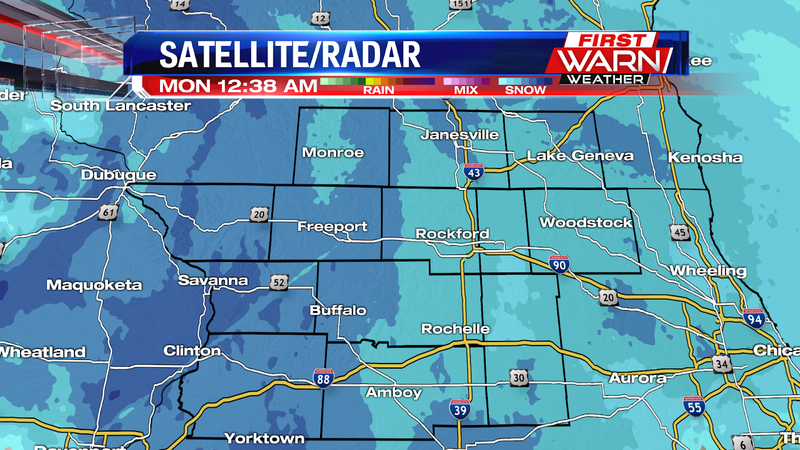 Snow totals have been slow to come in, but range between 2-4 inches so far. Blowing and drifting snow from what's coming down, to what was already on the ground, will continue. Roads remain snow covered and slick early Monday morning. 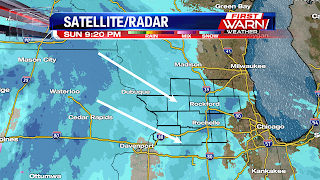 We will likely see the heaviest snow move east by 5am. 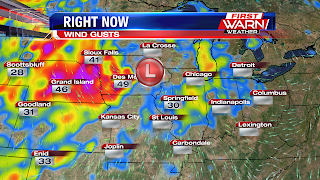 1:50am Update: Look at that wind in Rochelle! Lots of blowing and drifting snow. The snow is very light and easily blown around. The wind may lighten up a little between 6am and 9am, but should begin to increase once again mid to late morning and afternoon once low pressure passes. Early Monday morning winds will be coming in from the southeast before shifting around to the northwest the rest of the day. 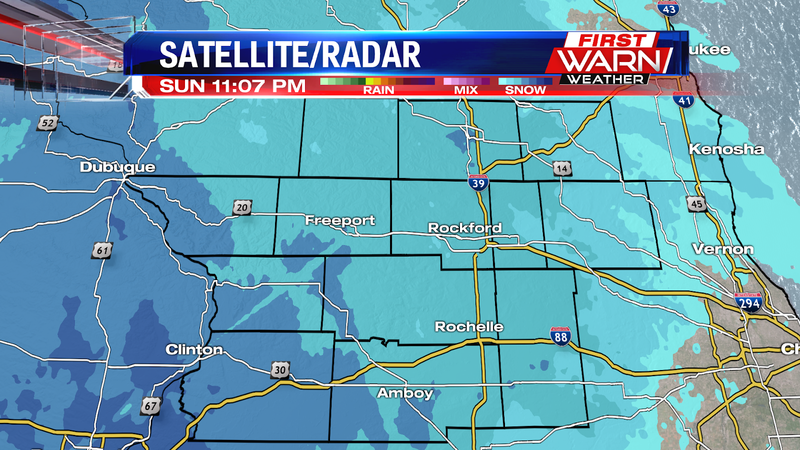 12:40am Update: Incoming band of moderate to heavy snow from the west. 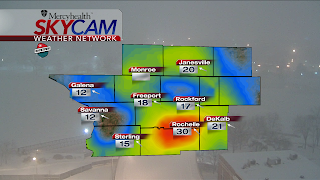 Visibility will quickly drop with the gusty southeast winds, causing blowing and drifting snow in open areas. 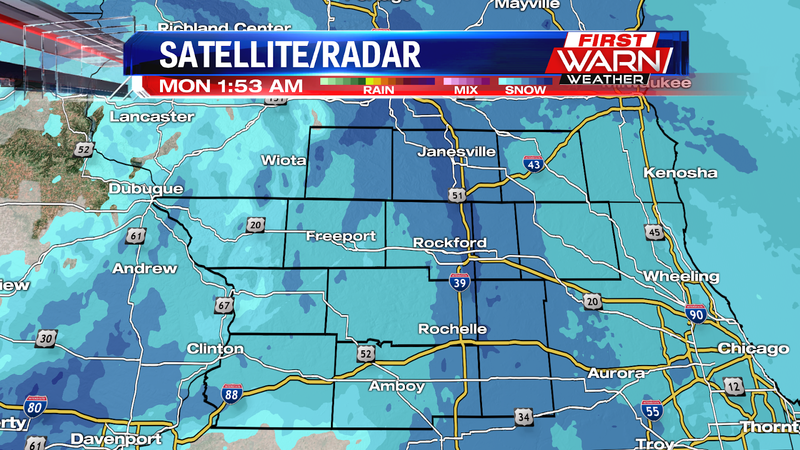 Rapidly accumulating snow likely through 4am. 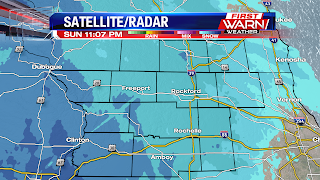 11:00pm Update: Moderate snow is beginning to move into parts of Jo Daviess, Carroll and Whiteside counties. 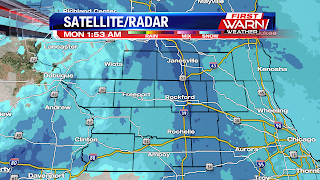 Visibility has fallen under half a mile as road conditions continue to deteriorate under the more moderate snow bands. Snowfall intensity will continue to increase after Midnight, lasting through roughly 5am/6am for some. Here are the latest road conditions per IDOT. Parts of Highway 20 are already reported as snow and ice covered. 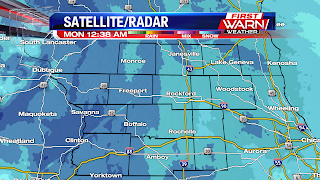 Road conditions will continue to deteriorate through the night. 9:20pm Update: Light snow continues to fall across northern Illinois and southern Wisconsin, with already a light dusting being reported in some locations. With temperatures in the single digits, the snow will quickly stick to untreated surfaces making roads slick late this evening. Higher than normal snow to liquid ratios will cause the snow to be lighter and fluffy. 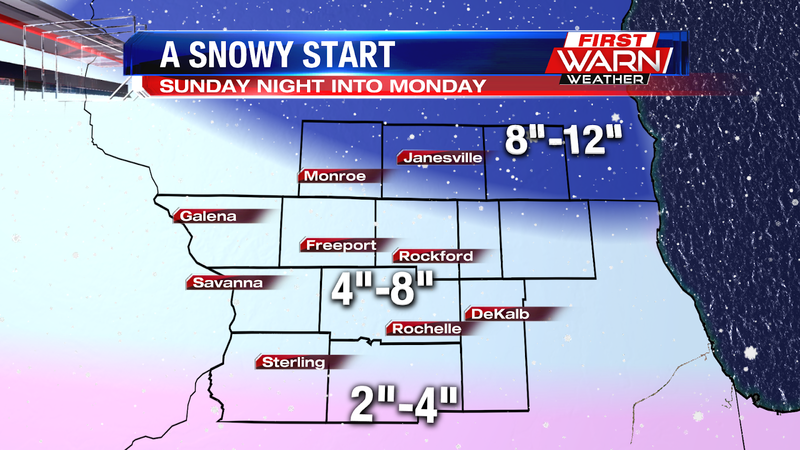 Increasing winds will cause the snow to blow around during the overnight, and into Monday afternoon. 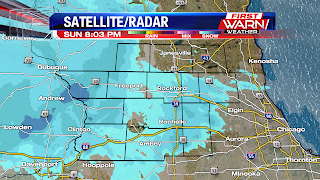 8:00pm Update: Light snow has started to move into northern Illinois and southern Wisconsin. Right now most of it is light but the intensity should begin to increase between now and Midnight, becoming a little more steady during the overnight. Winter Storm Warnings and Winter Weather Advisories remain in effect for all of northern Illinois and southern Wisconsin through Monday afternoon. northwest over much of the Upper Midwest and will continue to spread eastward through the night. Snowfall rates could be as high as one inch per hour under some of the heavier snow bands during the overnight. This combined with blowing snow will make travel difficult during heading into Monday morning. Snowfall totals will likely range area wide between 4-9 inches, with the highest snow totals occurring on either side of Highway 20, and the lower snow totals further south. Most of the accumulating snow will be wrapping up around 7am Monday, but as low pressure moves overhead there may also be a period of freezing drizzle that mixes in with some of the lighter snow. If this occurs, it'll likely make travel even a little more slick into Monday afternoon. Winds will then shift around to the northwest on the backside of the low during the afternoon bringing temperatures down below zero degrees by Monday night. 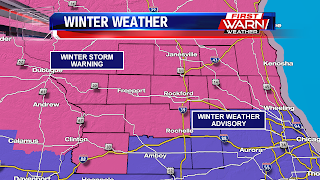 Winter Storm Warnings will go into effect Sunday evening for the following counties: Jo Daviess, Stephenson, Winnebago, Boone, McHenry, Ogle, Carroll, Whiteside, Green, Rock and Walworth, while Winter Weather Advisories will into effect for Lee and DeKalb counties. 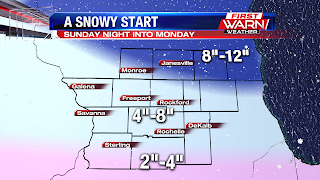 Accumulating snow, some of which will likely add up to over six inches across the warning areas, will begin late Sunday evening, lasting into Monday morning. It's also possible freezing drizzle may mix in with some of the snow Monday morning. Impacts to the Monday morning commute are to be expected, so make sure you plan ahead. Snow totals and exact timing will be coming soon! Good evening Stateline! What a way to wake up this morning. 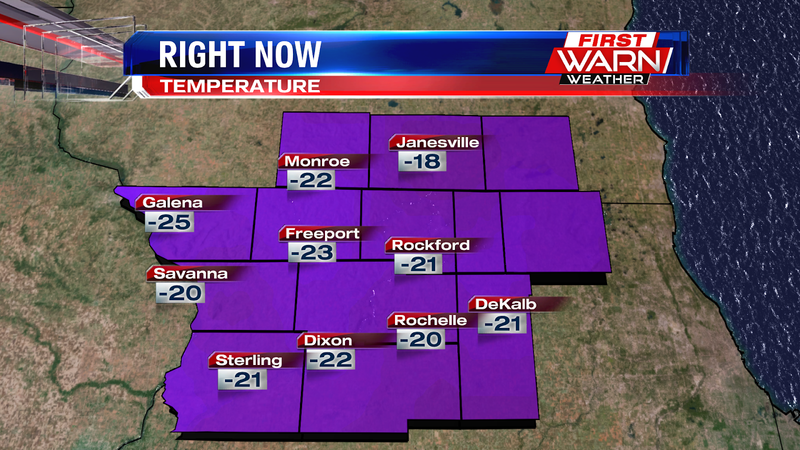 With clear skies and calm winds, temperatures this morning bottomed out into the -20's. 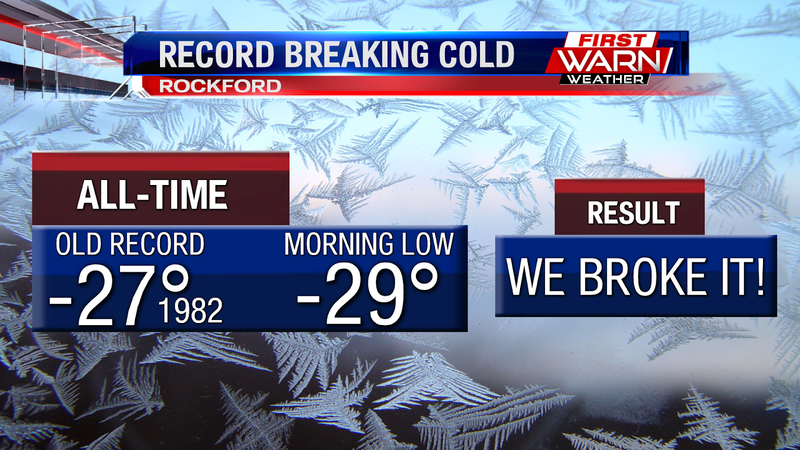 Just enough to break our daily record low of -18° set back in 1982. This was also 6° shy of our all-time record of -27° set back on January 10th, 1982. 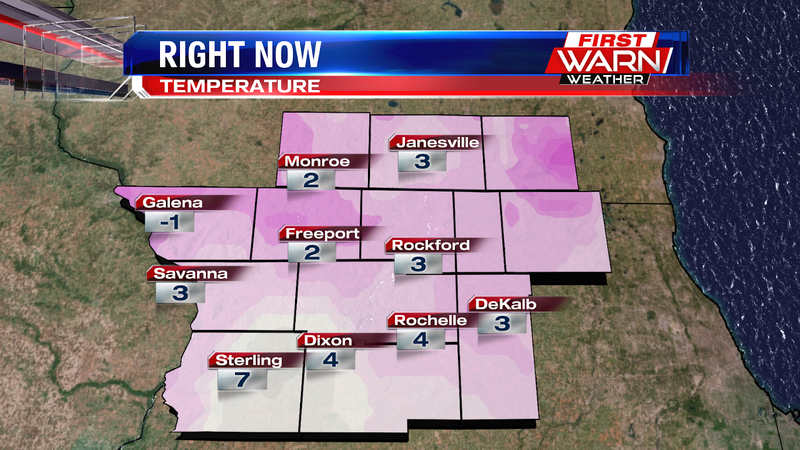 Rochelle bottomed out to -27° and Sterling was the coldest spot in the viewing area with a low of -29°. Pretty incredible! 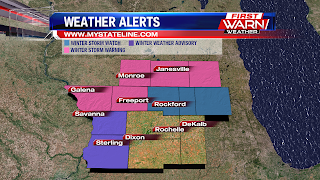 We did start off the day with a winter storm watch for our northern counties. 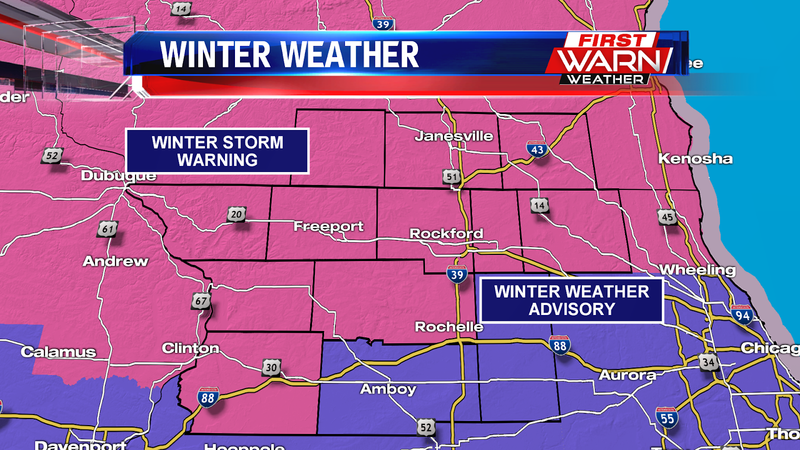 Since then, Jo-Daviess, Stephenson, Rock, Green, & Walworth counties were upgraded to a winter storm warning. 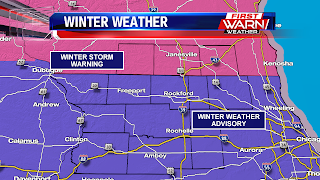 Both Carroll and Whiteside county are in a winter weather advisory and all of these go into affect at 6 PM tomorrow evening and last until 6 PM Monday evening! Here is our first call snow map. 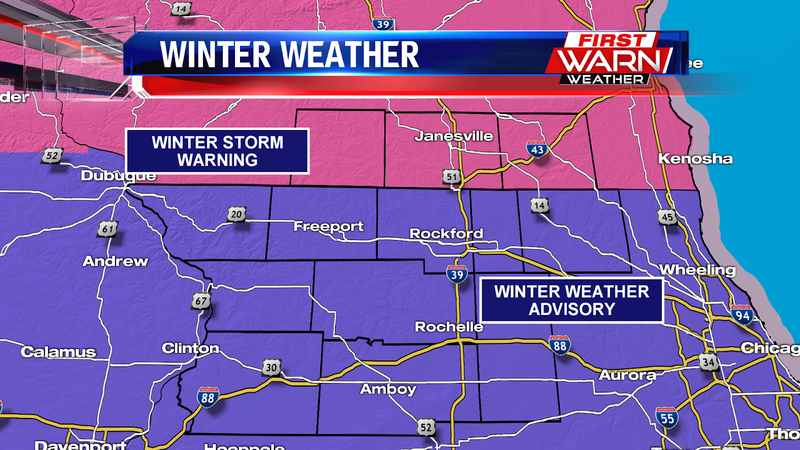 This winter storm looks to take a track right over or just north of the Stateline. 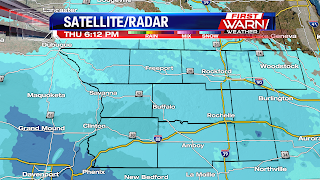 So some areas in southern Wisconsin will see 8" to 12" of snow. 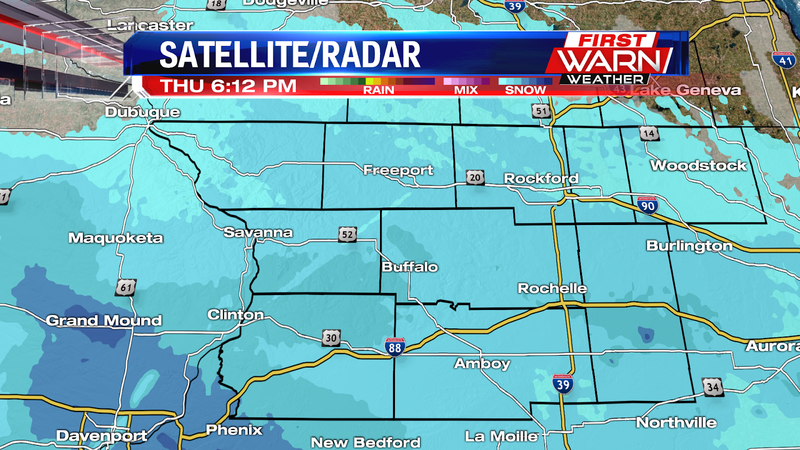 Places like Rockford, Freeport, and Galena should expect 4" to 8" of snow. If you live to the south, temperatures will be near or over the 32° mark resulting in lesser snowfall totals. On the backside of this system, potentially all-time record breaking cold air moves into the Midwest. Low's both Tuesday & Wednesday will range between -20° to -30° and wind chills between -40° & -50°. Try not to go outside that much during this time frame because this is the type of weather where frostbite can occur within minutes on any exposed skin. For right now, we are forecasting a low of -21° on Tuesday & a low of -24° on Wednesday. Both look to break the daily record low that were set back in 1966. This air mass could be cold enough to break the all-time record low in Rockford of -27° set back on January 10th, 1982! Stay warm Stateline!